Rent lit furniture for your Chicago special party event. 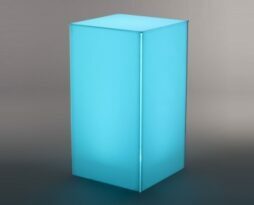 Using lighted acrylic, you can really add that “pop” that is needed to have your room décor shine. 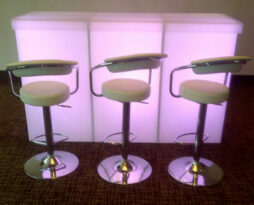 Rentals on all lit furniture can be customized to suit your function or need. Customization with branding purposes can be made on all acrylic lit furniture pieces to help you achieve your goals for your Chicago corporate or social event. 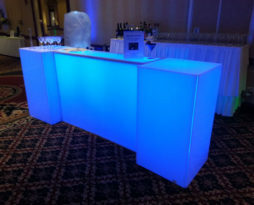 Rent this white acrylic hiboy bar to add a uniquely customizable acrylic bar to your events. Utilize this piece with a modern approach while using one color or three color LED lighting. Having this bar allows you to display three branded unblended colors for each 1/3 of the bar. This is because the bar is actually three highboy tables put together so the LED color remains locked in each table without blending together. This item can be branded with a vinyl application on its exterior to further support your branding needs. Adding on a back bar is essential. Add a standard back bar or choose an really upgraded acrylic back bar (three 30″x30″x30″ acrylic tables). Use an acrylic light up LED bar in corporate functions, fund raisers, weddings, benefits, galas, tradeshows, parties, product introductions, and for any event where making a modern branded impact is the intended result. Acrylic bar dimensions: 36″x72″x42″ (42″ height for bartender as well as no shelf available on this bar option). 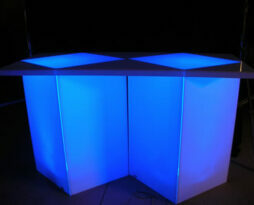 Rent this diamond acrylic bar to add a high class modern wow factor to your events. Utilize this piece with a modern approach while using LED lighting as branding or as creating atmosphere. The diamond acrylic LED bar has a modern clean appearance. This item can be branded with a vinyl application on its exterior to further support your branding needs. This item is shown with LED lights, but are not included with this item. Please add in two LED wireless lights for a six foot long and three wireless LED lights for an 8eight foot long top to get the desired effect. See the option located on this page to add in the LED lighting. Most colors can be achieved with a wireless LED light. Use an acrylic light up LED bar in corporate functions, fund raisers, weddings, benefits, galas, tradeshows, product introductions, and for any event where making a modern branded impact is the intended result. Acrylic bar dimensions vary from table height to bar height and a six foot long bar top to an eight long foot bar top. A six foot bar/table (30″W x 72″L x 42″H) has two column pedestal bases. An eight foot bar/table (30″W x 96″L x 42″H) has three column pedestal bases. A 30″ height base may be used rather than the 42″ to change this item from a bar height table to a dining height table. 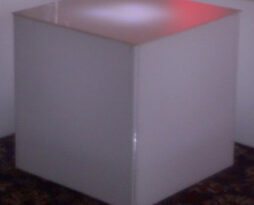 Rent this white acrylic bar to add a high class modern clean look to your events. 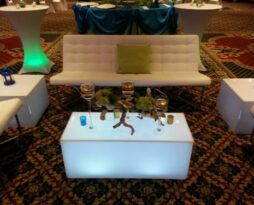 Utilize this rentl acrylic bar for your Chicago events. This rental bar shows a modern approach while using LED lighting as branding or as creating atmosphere. The white acrylic LED bar has a modern clean appearance. This item can be branded with a vinyl application on its exterior to further support your branding needs. Note: The blue ice bar pictured is the white acrylic bar with added high boy ends. The standard white bar does not come with these unless you choose that option below. Adding on two white acrylic bar height highboy tables to the left and right sides of the bar is very common when clients rent our service bar. Acrylic bar dimensions: 36″x72″x42″ (30″ height for bartender). Rent this white acrylic bar height highboy table to upscale your events with a modern approach while using LED lighting as branding or as creating atmosphere. The acrylic end table has a modern clean appearance. This item can be branded with a vinyl application on its exterior to further support your branding needs. This white acrylic bar height highboy table rental is very common for use in corporate functions, fund raisers, weddings, benefits, galas, tradeshows, product introductions, and for any event where making a modern branded impact is the intended result. The acrylic high boy comes with a top that is as wide as the diameter of the table. To upscale the look, add on an overlapping acrylic top which adds one foot of surface area around the whole table. This added large top is a great feature when you are having bar height seating at this table. This modern functional masterpiece is sure to hit the mark with your guests. The white acrylic can also be stacked together to form serving areas, carving stations, service bars, product displays, or any other purpose that can help you achieve your goals. Contact us for pricing on branding potential. Rent this white acrylic coffee table to upscale your events with a modern approach while using LED lighting as branding or as creating atmosphere. The acrylic coffee table has a modern clean appearance. This white acrylic coffee table rental is very common for use in corporate functions, fund raisers, weddings, benefits, galas, tradeshows, product introductions, and for any event where making a modern impact is the intended result. This modern functional masterpiece is sure to hit the mark with your guests. The white acrylic can also have vinyl branding applied to its surface. Contact us for pricing and branding potential. Rent this white acrylic end table to upscale your events with a modern approach while using LED lighting as branding or as creating atmosphere. The acrylic end table has a modern clean appearance. This white acrylic end table rental is very common for use in corporate functions, fund raisers, weddings, benefits, galas, tradeshows, product introductions, and for any event where making a modern impact is the intended result. Rent this Club series white acrylic LED bench to color your events with a modern approach while using LED lighting as branding or as creating atmosphere. The acrylic coffee LED bench has a modern clean appearance. This white acrylic LED bench rental is very common for use in corporate functions, fund raisers, weddings, benefits, galas, tradeshows, product introductions, and for any event where making a modern impact is the intended result. 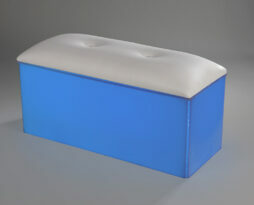 This modern functional acrylic bench is sure to hit the mark with your guests. The white acrylic can also have vinyl branding applied to its surface. Contact us for pricing and branding potential. Rent this Club series white acrylic LED seated ottoman to color your events with a modern comfortable approach while using LED lighting as branding or as creating atmosphere. The acrylic coffee LED bench has a modern clean appearance. 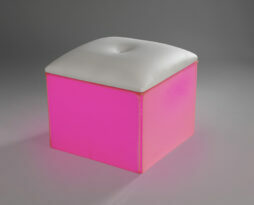 This white acrylic LED seated ottoman rental is very common for use in corporate functions, fund raisers, weddings, benefits, galas, tradeshows, product introductions, and for any event where making a modern impact is the intended result. This modern functional acrylic chair is sure to hit the mark with your guests. The white acrylic can also have vinyl branding applied to its surface. Contact us for pricing and branding potential.